The hipster, a character that is ever-so-commonly talked about in our city. Berkeley has always been known for being ahead of the times, so it only makes sense that we are a campus populated by trendsetters. As one of the self-proclaimed leaders of the counterculture movement, we would like to investigate the evolution of the hipster and what exactly #trendy was throughout the decades. Ah, the big bang of the hipster movement. In Berkeley it all really started cooking in the ‘60s, with the Free Speech Movement and anti-war protests. Back in the day, the Berkeley Barb covered all of the shenanigans of this era and defined what it meant to be a liberal. The true hipsters centered themselves on an opposition to the corrupt mainstream society and were led by revolutionaries such as Mario Savio. These lads and ladies were the real deal and started tie-dye and John Lennon sunglasses and had the Woodstock vibes all the modern-day poser hipsters seek to embody. In short, the ’60s hipster was legit. Let’s get physical? The ‘80s hipster thought not. In the era of MTV and polyester, the Berkeley too-cool-for-school folks were occupied with writing philosophy on the moral dilemma of technology and planning how to get Reagan the hell out of the White House with his trickle-down-economics hoo-hah. These folks thought Madonna was a true material girl, as in materialist as f*ck, and they had no patience for John Hughes. They traded in acid-wash jeans for Birkenstocks and reminisced of simpler times. They preached that the sheer amount of hairspray used in this era would lead to global warming — can we blame them? Finally. 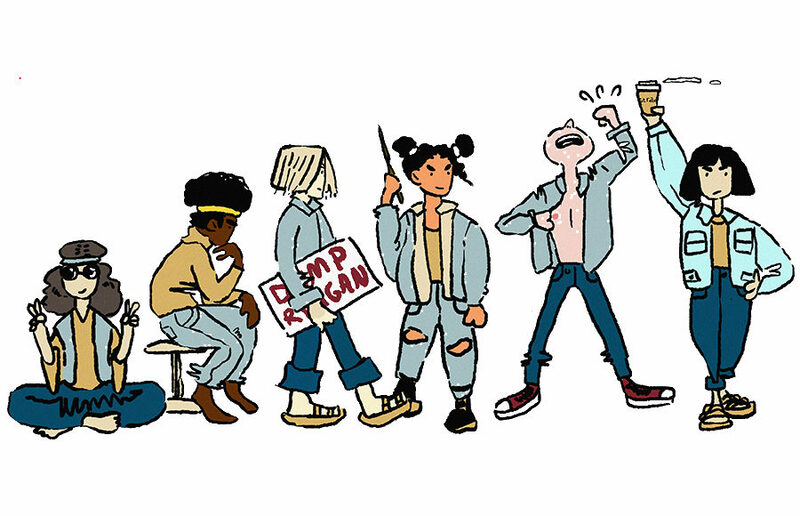 The Berkeley hipsters could connect with the mainstream. With the popularity of the grunge look, our flannel-loving peers can resonate with popular culture at last. Oh, but let’s not get carried away, pals — the ‘90s hipsters were still #woke as always. They recognized the racism in “Forrest Gump” and allowed us to recognize the similarity between JT’s frosted tips and top ramen. These anti-everything enthusiasts had no time to be #teamrachelandross and did not want to be hit “baby, one more time.” Not to worry, though; as much as these “kewl” kids tried to hide it, they secretly loved Nirvana. It smells like teen spirit in Berkeley, aye? And with “Harry Potter” unleashed in the world, at least all the Golden Bears of the almost-2000s could check their cool-kid card at the door to fantasize about the world of Hogwarts. Wingardium Leviosa! Snoooooop. Why yes, the Berkeley hipsters of the nineties obviously comprehended the mastery of Snoop Dogg and knew we were blessed to “drop it like it’s hot” to his tunes. These individuals paid homage to Michael Jackson’s last album and paid their respects to the King of Pop. Moreover, with the rise of reality TV, the new FSM wannabes said “nay” to reality TV and were surely American Idol and Glee #haterz. Not to fret, though — there was definitely a “free the nip” vigil on Memorial Glade in 2004 for Janet Jackson’s Super Bowl wardrobe malfunction. Nowadays, the Berkeley hipster is terrified of anything #basic, and avoids the Kardashians, “The Bachelor” and the dog filter on Snapchat like the plague. But, let’s be real — we know this is all a front. We know our hipster comrades secretly worship Adele, have the hots for Bieber and know the word to every Taylor Swift hit. They slyly yell a firm “Go Bears!” whenever they see Oski on campus and all congregate at Caffe Strada as the rest of us do. So if you’re basic or hipster alike, we’re all Golden Bears here. And whether we choose to admit or not, those ‘60s folks will never be topped.